House Near Cognac, Charente, France - Rural Location, 3 Or 4 Mins To Nearest Bakery. 10mins To Town With All Commerces And Weekly Market. Beautiful, luxuriously appointed, south facing 18th century house with large private heated pool. 5 large bedrooms plus further occasional 2nd floor mezzanine with double bed, sleeps 12/14. 4 bathrooms/shower rooms (2 en-suite). Huge 50m2 reception room with comfortable sofas/chairs, cd music system and a grand piano. Big 36m2 TV room with woodburner. 50'' flat screen tv and Bose cinema surround sound system. Several hundred varied dvds freely available. Wi fi access. Extremely well appointed kitchen with 2 full size ovens and separate 5 burner hob, dishwasher, fridgefreezer and large stainless steel topped workstation. Adjoining dining room with fireplace, sofa and woodburner. Utility room with washing machine. Ground floor cloakroom. The gardens and heated pool to the front are fully enclosed, private and south facing. There is plenty of space for sun bathing and a choice of areas for alfresco dining, including a lovely covered shady area with it's own seating and fireplace. Hi, my name is Robert ( Rob ). After years of renovating houses and interior designing in Britain, my partner and I, bought and renovated this beautiful charentaise " Maison de Maitre" [ Masters house] Being one of six children, we have always had plenty of family and friends staying here with us, and so knowing how well this house accommodates everyones needs, whether old or young, we have decided to rent out the house. I hope you love it as much as we do. En-suite to bedroom 1 with walk-in shower, basin and wc. Bathroom with large shower enclosure, wc and basin. En suite to bedroom 5 with large shower enclosure, wc and basin. Bathroom with bath, large shower enclosure, wc and basin. Groundfloor WC. All good quality Egyptian cotton sheets. Outside washing line and covered area for a clothes airer. Inside dining area Outside tables for dining al fresco, including under BBQ area Plenty of seating and tables. 50'' flat screen and surround sound system. Golf in Cognac, 20 minutes away or Angouleme around 30 mins drive. Smokers are welcome, but we do ask you not to smoke in the house. We have a dedicated covered area just outside the back door (in case it rains) And of course you will be spending most of your time outside anyway, where there are lovely seating areas. With wide steps for easy access by everyone Heated when necessary, within normal season. Notes on accommodation: The house is enormous but still very welcoming. The vast ground floor rooms have been sympathetically decorated using Farrow and Ball colours and flow effortlessy from one to another.It is south facing and all of the windows look out over the beautiful gardens and pool area. The kitchen window overlooks a pretty mill and stream which runs behind the house. The gardens are private and secure. The only available access to the rear grounds is through the kitchen door. Therefore, the stream should not be an issue for families with very young children. Parking is available either at the front of the house, or the rear, which people tend to find more convenient when carrying shopping, luggage etc. There is Wi fi access. The house sleeps a maximum 14 people Discounts: We are able to offer discounts for smaller groups (Not during high season),who wish to enjoy the luxury and space the house provides. Please contact us to discuss options. Outside: Large private and enclosed garden, with several seating and dining areas. Seperate, private and enclosed pool area. Heated Pool 10x5m with sun loungers and chairs. Beautiful enclosed roofed bbq area with fireplace, seating and dining table and very large gas bbq. Perfect area for an afternoon snooze in the shade. Logs are available for the fire, so dining on cooler evenings out of season can become very cosy and inviting. Private parking for several cars at the front gates or within the grounds at the rear of the house. Utility Room: Washing machine and microwave. Plenty of storage space and worksurface, shelving Second fridge for drinks and food for large groups. Towels / Linen / All towels and linen provided.. Supply of pool/beach towels available. All bed linen is superior quality white Eygptian cotton. Cleaning/maid service can be requested at extra cost. Lots of character and well designed rooms. Party of 7 with 4 dogs and we all thoroughly enjoyed our stay. Robert and Philip were great hosts, available if needed but otherwise unobtrusive. Would definitely recommend this to others and we hope to come again sometime. Also, good value for money. 5 star venue for a family reunion - with on-site service to boot! We had visited here on a recce last September, preparing for a family reunion this year and were most impressed. The property is in terrific condition, all as described in the listing. What tops this compared to other properties is the presence of the owners Phil and Rob in their adjoining but discrete property next door. We were arriving from all points of the globe and utilised Rob and Phil's offer on arrival of preparing a meal for us saving either risking delays or us having to cook on the first evening. A fabulous feast at a reasonable price was delivered saving much stress. Their attention to every detail and daily maintenance of the pool was most appreciated, removing the worry of other establishments that if anything goes wrong it will not be immediately rectified. Their helpful, yet unobtrusive presence and tips meant a most enjoyable week. Highly recommended, this is a terrific place to enjoy a good get together, with fully equipped kitchen for home catering, wonderful reception rooms with real character and tastefully furnished. Complete with grand piano as well as plenty of restaurants, supermarkets and boulangeries within short travel times. The Charente valley is an undiscovered haven for culture and water sports, un-touristy, certainly for the Brits who tend to congregate further south in the Dordogne. We loved Angouleme, Cognac, Jonzac, Saintes and the sea at Royan - don't miss it! Excellent property that catered for our large family including two dogs. The facilities are extensive. The outdoor area is cleverly designed into three areas: secure pool and games area, BBQ, and main garden. Indoor facilities are large and extensive. The owner was very accommodating and flexible to our requirements. The house is totally private to ensure a very relaxing holiday and location excellent to explore this part of France. stay was fantastic, the beautiful house and grounds, the glorious weather, the fantastic pool and not forgetting the lovely chickens! Thank you, Thank you! You were the perfect hosts and I am so very glad we got to stay at your amazing home. We had a fantastic stay. It is always a challenge to find a house to suit 10 family members across 3 generations but this was perfect. Lots of space, places to relax and areas for play. Inside, the house feels like a real home (which it is during the winter), the garden was big enough for the children to play various sports and everyone loved to relax by the pool. It is always a treat to eat outside and there was lots of different spots to do this - we were particular fans of the local farm shop which we used to stock up for our daily barbecues. Robert and Philip were great and it was really helpful to have them nearby to ask for local advice. 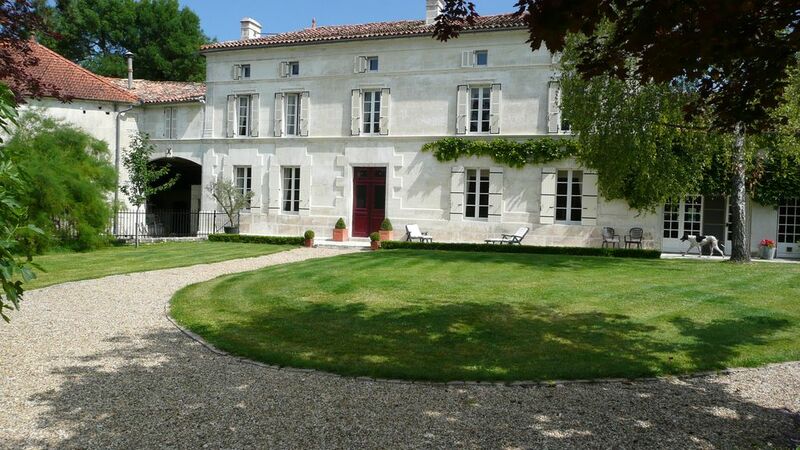 The house is located in a attractive and quiet area of the Charente, but there are enough local restaurants and places to visit if you can drag yourselves away from the pool. We especially enjoyed a morning kayaking at Jarnac. We are all looking forward to returning for another family holiday. The Atlantic coast is less than an hours drive away with the Côte Sauvage offering some of the most stunning coastline in the South-West. La Rochelle is around 1hr15mins away and from here you can also explore the beautiful islands of Ré and Oleron just off the coast. Bordeaux airport is the most convenient, and is one hours drive; car hire is necessary, and very easy to arrange at the airport. Other airports within easy driving distance include Poitiers, Limoges and La Rochelle. The channel port of Calais is around 625km away with Caen and St Malo being 411km and 383km respectively. The nearest town is 9km and has a choice of several supermarkets,bars and restaurants, a weekly street market and pharmacies, banks and doctors. The pretty town of Cognac is a 20min drive. CHRISTMAS/NEW YEAR ....Why not spend the festive period with friends and family ensconced in our lovely home. The house, although huge, is incredibly warm and cosy during the winter months, thanks to the modern oil fired heating system and woodburners.Seasoned oak logs are supplied for the logburners.Beautifully interlined drapes and gorgeous throws on sofas and beds complete the picture. The kitchen is an amazingly well equiped/appointed space...even the keenest of cooks would be happy to cater for very large groups. Cognac Blues Passion July 2012...headliners, including Sting and Tom Jones...the biggest Blues festival outside of the USA. 4 days of fabulous music held at various venues (Outdoor and indoor) around the beautiful town of Cognac. Circuit des Remparts, Sept .....A weekend of classic car rallies culminating on Sunday with an thrilling day of racing around the streets of Angouleme. This event is not to be missed and attracts entrants from all over Europe. Changeover Day: Saturday is our changeover day. We ask you to arrive at 4 o'clock or after. Departure is before 10 am. We can be flexible on this out of season. Notes on prices: From £1200 to £2800 per week.